Sprint's BlackBerry PlayBook delayed | BlackBerry Blast! Sprint has already announced they would carry a BlackBerry PlayBook, and even announced a 4G PlayBook, but they can't quite keep a specific release date. Sprint was supposed to launch the PlayBook on April 19 but that was postponed. We then expected Sprint to release a PlayBook on May 8, but it looks like that date won't hold either. 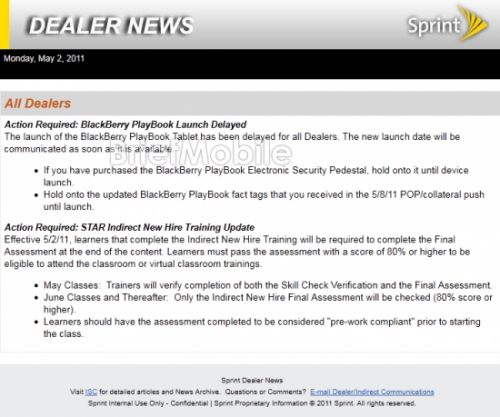 In a memo to dealers Sprint says the PlayBook is again delayed. The memo says, "The launch of the BlackBerry PlayBook Tablet has been delayed for all Dealers. The new launch date will be communicated as soon as it is available." RIM has said that demand for the PlayBook has exceeded expectations so perhaps Sprint just can't get their hands on it. Stay tuned.